Deep in the bowels of the SS Jeremiah O’Brien, Shipkeeper Chris Friedenbach speaks tenderly of the sixty year old vessel he maintains. His voice, though barely louder than a whisper, reverberates off of the towering walls of the ship's engine room. The cavernous space he stands in, thick with the smell of the oil covering every mechanical surface, is still much the same way as it was when the O’Brien was launched in 1943. He tells me of steam engines, specifically the immense four-story-tall example in front of him - standing at the bottom of the engine room, we can't even see the top of the engine around all the pipes and walkways. “Everything on this ship is powered by steam, even the coffee pot,” he tells me, and indeed, the O’Brien’s original percolator has a direct line to the engine room, still caffeinating the sailors who tend to her now as it did the merchant mariners who sailed her across the Atlantic so many years before. The O’Brien is a 'Liberty ship', a type born from a need for cheap, easy to build freighters to replace Allied losses in the U-Boat infested Atlantic during World War II. Shipyards across the country, including the Kaiser Shipyards across the bay from her current mooring spot at San Francisco's Pier 45, cranked out these ships at phenomenal rates. On average, it took these shipyards an incredible 60 days to build a ship, from the laying of the keel to the launch - the O'Brien took only 56. Out of the 2,710 that went to sea, only two remain in seaworthy condition. The O’Brien survived the landings at Normandy, two crossings of an unforgiving Atlantic teeming with U-Boats, and sixteen months in the South Pacific. When she returned to the US at the end of World War II, she was laid up in the Suisun Bay mothball fleet, just north of San Francisco Bay. In the late 1960s, Washington politicians floated the idea of preserving an unmodified Liberty ship as a museum and memorial to the Merchant Mariners of WWII. Rear Admiral Thomas Patterson and the newly established National Liberty Ship Memorial elected to save the O’Brien from the scrap heap as she was still in relatively good shape for an abandoned ship. Finally, on May 21, 1980, a crew led by NLSM director Capt. Edward MacMichael managed to relight the veteran ship's immense boilers. The O’Brien, after sitting in a rusting flotilla of ships for more than 30 years, simply started up and sailed away from the Suisun Bay ghost fleet under her own steam - a feat few ships of any kind have ever managed. The only other Liberty still in existence, the John W. Brown, required three years of extensive restoration in drydock before her boilers could even be lit. 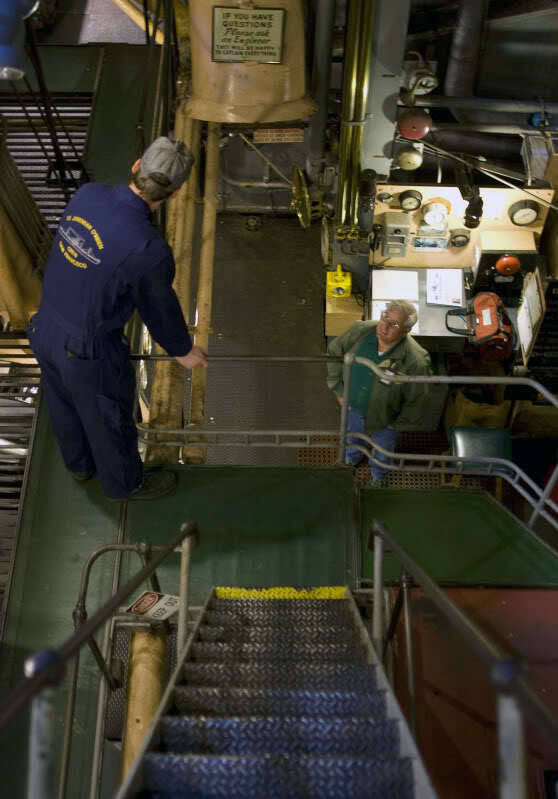 Shipkeeper Chris Friedenbach shows off the O'Brien's engine room. Back in the engine room, video monitors play a loop of footage from James Cameron’s 1997 movie Titanic. When the producers of the movie sought a life-size marine steam engine, they found the O’Brien and her triple-expansion engine a perfect fit. “People talking at a loud bar would be noisier than this engine when it’s running,” Friedenbach says. And it’s true; when the film's sound crew edited the scene, they dubbed in their own synthetic steam engine noises because the O’Brien’s plant was not noisy enough! The O'Brien's steam engine is still fired up occasionally for cruises during Fleet Week and other special events. This is only a small slice of the three-story high engine that Freidenbach helps maintain. Friedenbach hoists himself up an impossibly steep staircase, moving with practiced grace, like a dancer rehearsing a well-known routine from memory. He crouches through a half-height door and slinks down another ladder into the ship's steering gear compartment. “Think of it as big power steering,” he says, pointing to the massive gears before him connected to the rudder. This room would have been unmanned, he explains, except in the case of a steering failure - if the ship's wheel on the bridge stopped responding, the O'Brien could be directed from here. Later, as we head up towards topside, Friedenbach points out a room that almost certainly would have been manned in the ship's glory days: the wireless room. Inside sits a vintage marine radio that looks straight out of a Hollywood set, covered in serious-looking gauges and a myriad of knobs and switches. Like the steam-powered coffeepot, this original piece of equipment still works (its call sign is KXCH/K6JOB if you'd like to chat the crew of the O'Brien up), and is used occasionally to broadcast live while the ship is underway. Friedenbach has been tending these machines as well as the rest of the ship for the past ten years, along with the ship’s cook, known only as Vanucci. Vanucci, like Friedenbach, speaks in endearing tones about his favourite piece of kit on the ship. Vanucci’s imposing cast iron stove is, according to him, the last coal-fired marine stove in existence. “It takes three hours to turn on and heat up!” he exclaims. An average day finds him using his impressively sized range to cook up plate after plate of food for not only the crew, but for the visiting landlubbers as well. Vanucci inspects his fire-breathing marine stove. Outside, the wind coming off of San Francisco Bay nearly knocks Friedenbach down as he steps through a hatch to the main deck. They’re firing up her engines this weekend, he tells me, and next month they’re taking the ship out onto San Francisco Bay. The O’Brien’s engine is not started at the flick of a switch, and for Friedenbach, it’s going to be a full day. “It takes between 13 and 15 hours to start the engine because we have to wait for the steam to get superheated. Initially there’s a lot of condensation [to get rid of] in the pipes.” He doesn’t sound like someone who dreads a long day at the office, rather, he’s visibly excited about spending his weekend in the engine room of a 60-year-old ship. For Freidenbach, like so many of the sailors who came before him, the O’Brien is like a good friend - and as long as there’s a ship to tend, it’ll stay that way.